A well known name in Mumbai, Vaishnavipratima Signature Collection Store, named after the owner herself Vaishnavipratima Kodakalla, just popped open in Goa. 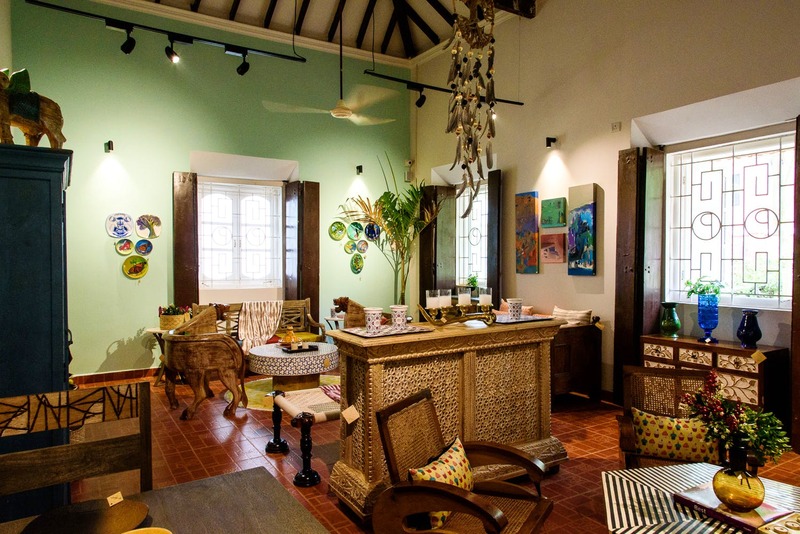 If you're after beautiful, handpicked collection of furniture, soft furnishings or fashion, head to this gem that's hidden away in the village of Salvador Do Mundo, in an old Goan mansion. Lots of things, but what we loved most was the homage paid to all her carpenters, welders, all workers who create these beautiful products by showcasing all the tools on a wall. Somehow every piece seemed to connect with us even more after seeing that wall. From plush armchairs, to pieces made using vintage wood pieces, crockery, paintings, to the macrame dream catchers, quirky artefacts, printed cushion covers to rugs, one could spend hours here and pick up things for as low as INR 399. Surprises like a re-purposed chips and dips platter into an artist's palate are aplenty here, including the cute cafe space that will be operational soon to just sit there and grab a coffee after you're done browsing and shopping. Fashionistas can indulge in beautiful real gemstone jewellery by Bhavaa (each piece is handcrafted to be one-of-a-kind). And if you love the Chanderi saris, or designer brand 'Pramaa' by Pratimaa, then this is definitely the place in Goa to buy some of her exquisite outfits. We already have our eyes on a few things, including those heavenly scented candles that came in a pretty metallic jars. The store is open every day from 10am to 8pm, and even has a pretty garden to leave your husbands/shopping partners relaxing in, while you browse for that second home you have to do up in Goa. You can even avail of her design services to get the interiors of your home done from scratch. P.S. They ship everything across India and even abroad.